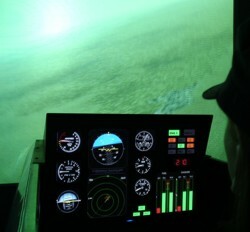 A flight simulator from Black Sky’s training curriculum (Credits:Black Sky Training). Commercial spaceflight took another step forward on March 28 when the Federal Aviation Administration (FAA) awarded commercial suborbital flight training company Black Sky Training the first ever safety approval for space training. “By establishing a standard protocol for training of the flying public and flight crews, they [the FAA/AST] have signaled the burgeoning space flight industry that nothing but the highest safety standards are to be provided to the passengers,” said Black Sky Chairman George Tyson. Black Sky Training is a privately held division of Orbital Commerce Project Inc. that provides advanced spaceflight training for spaceflight participants, flight crew, and Reusable Launch Vehicles (RLV) pilots. Their courses are taught by Master Certified Flight Instructors (MCFI), doctors of neurology, certified experts in human behavior, and Advance Ground Instructors (AGI). Black Sky Training will be presenting at the Sun-N-Fun forums, educational forums held in the Central Florida Aerospace Academy (CFAA) across from the Florida Air Museum from April 9 to April 14, 2013. Standards and certifications are important drivers for commercial activities growth. Commercial flight in the US started in 1926 thanks to the Air Commerce Act, meant to foster air commerce by issuing and enforcing air traffic rules, licensing pilots, certifying aircraft, and establishing airways. Doing so, the administration gave the keys to the sky, not only to those brave explorers and adventurers that devoted their lives to new discoveries, but also to ordinary citizens. It secured access to a new horizon eliminating hazards and threats. Today, commercial space access gets a relatively new start with federal agencies able to apply past experiences for the advancement of commercial spaceflight; in this case, by securing effective and certified training to consign space to people.